Where will we send the kids to school? This quandary is at the forefront of every military parent’s mind and guides most of the house-hunting decisions when relocating. 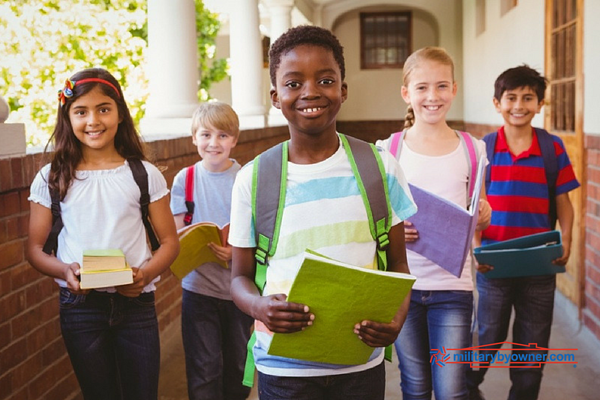 Military kids move an average of six to nine times during their school career, but repetition doesn’t necessarily make the process any easier. There are specific things that you can do each time you’re faced with choosing a new school, and your friends at MILLIE would love to help guide you on your way! You’ve got orders — Now what? Once you know which installation your family will be relocating to, you can start to do some research on the area. What options are there on base vs. off base? How does that affect which schools your child will have access to? Get a feel for the school layout by visiting MILLIE’s Installation Guides.Each area surrounding the installation is broken down, and we’ve given you a starting point for your school research. Our School Scoop sections contain standard info like district names, GreatSchools ratings, and admission requirements. We also gleaned our vast network of military spouses for extra nuggets like lottery deadlines, transportation concerns, and military-friendly practices and programs. As a bonus, you’ll also find the School Liaison Office contact info on each of our base pages. Though the most common way to compare schools is through a score given to it by an online resource, it doesn’t always provide the entire picture. There are several things you should take into account when looking at a good fit for your student and your family! Take note of these criteria when evaluating a school, jot down some notes, and compare your “score” for each. To help you keep track, here is a nifty worksheet that you can download for free with all of this info and more. Commute — Will your child walk, ride the bus, or be driven? How long will it take to get to and from school? If bus transportation is available (sometimes it’s not), how long will your child be on the bus each day? If you live on base, but your child’s school is off base, what arrangements are there? Class Size — Class size and the student to teacher ratio are important factors to consider. How does your child thrive? Do they do best in a small class with lots of hands on attention, or are they indifferent? Of course, everyone would opt for small classes if given a choice, but some kids really need it, and others are more resilient to the larger classes. Specials — What are the extra courses and school offerings that make a school shine? Are you looking for art classes, languages, music, P.E., or robotics? Some schools are bursting with special classes, and others struggle with funding. Pros + Cons — This is your time to list out all the pros and cons to a particular school. It’s the perfect school, but the bus ride is 90 minutes each way. It’s nearby, has an enviable athletics program, but offers no foreign language classes. These are all factors that you need to jot down and evaluate! Choosing a school is daunting, but it doesn’t have to be. We encourage you to actually call the school and talk to an administrator. Interview the school with your child’s learning style in mind. Explain to the principal that you would like a very well-rounded overview and you are expecting to hear the positive and the negative aspects of the school. What is the learning environment like? Is classroom instruction predominately teachers lecturing or do they incorporate group learning strategies? What systems are in place to accommodate different learning styles? What is the school’s process for transferring 504 plans and IEPs? What makes your school different than other schools in the area? What is the balance of work and “play” (enrichment time)? Is there a lot of homework? Get specific with this — “How much homework does the 3rd-grade teacher assign nightly?” Do younger kids get recess and for how long? What curriculum are you using? What is your grading system? You need to take into account your child’s school needs, the school comparison, and the answers to the interview questions to arrive at a 360-degree look at the school situation you’ll be in when you move. Our worksheet can help you keep everything in one place as you start to do your research, so feel free to grab your copy!